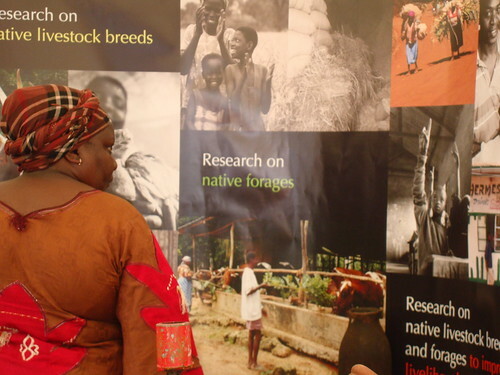 The 15 centres belonging to the Consultative Group on International Agricultural Research, including the Africa-based International Livestock Research Institute (ILRI), are passionate advocates and conservationists of plant and animal genetic material that is indigenous in developing countries, much of which is in danger of being thrown into the dustbin of history as these countries modernize. Perhaps no recent story embodies the polar-opposite interests that can arise between conservationists (of our genetic heritage) and developers (of our urban environments as well as rural agricultural systems) as succinctly as the story running in this week’s Economist, which tells of a plant genebank outside St Petersburg, and all its stored living genetic materials, being threatened by destruction by a bulldozer for the sake of urban development. As the Economist article points out, it didn’t used to be this way. ‘Russia’s greatest plant scientists died of starvation rather than eat their collection. . . . By 1941, the Soviet Union had established an enormous gene bank of plants containing 187,000 varieties at the Institute of Plant Industry in Leningrad (now St Petersburg). When the city was blockaded by the Germans, so important was the collection some of the scientists gave their lives to save it. ‘. . . Such sacrifice is worth remembering, because at a court hearing in Moscow next Wednesday, real estate developers will find out whether they are allowed to bulldoze part of the institute’s living collection held at the Pavolvsk Experimental Station, just outside of St Petersburg. The institute contains thousands of varieties of apples, strawberries, cherries and many other crops, 90% of which are not found anywhere else in the world. ‘. . . Scientists died to protect the diversity that is needed to breed new varieties of plant that can cope with changing conditions, such as drought. They knew that this diversity is an essential weapon in the fight the hunger, malnutrition and mass starvation. Tags: 2010 International Biodiversity Day (Nbi), Economist, Plant genetic resources, Russia. Bookmark the permalink. This is tragic! What can be done to save it? Every day Nourishing the Planet, a blog at the Worldwatch Institute, will publish three answers to the question Where Would You Like to See More Agricultural Funding Directed? You can email a response, or tweet it, but I’ll just say something here. For me, the biggest single problem about current mainstream agricultural funding for development is that it is all chasing the same unimaginative goals. Adding another USD$300 million a year to the pot is a wonderful thing, but it is like more water pouring down a gully. It deepens the channel but makes it even more difficult to jump out of that channel and find another path. Given how little is currently spent on the more effective use of agricultural biodiversity, I reckon just a tenth of that, say USD30 million, would make a huge difference to the ability of people to enjoy a food secure future. Throw in another USD30 million for extension services, and I reckon you could really see some impact. Don’t get me wrong; things like infrastructure are important too. But in the end, lots of people are doing that. Let’s see a little money devoted to trying something different. What do you think? If you send a suggestion to Nourishing the Planet, why not copy it here too? Pavlovsk finally in the news, again. Absolutely nothing material has changed in the circumstances surrounding the possible destruction of the Pavlovsk Experiment Station, which we first blogged about in April. The hearing date — when courts will decide whether the land should be bulldozed to make way for private houses, destroying the world’s largest genebank of fruits and berries — has come closer, of course. It is scheduled for 11 August, next Wednesday. And this morning the Global Crop Diversity Trust put out a new press release highlighting the imminent court case and adding to its public campaign to persuade the Russian Bear that berries are better than bungalows. So, naturally, Pavlovsk is now in the news, for The Economist blogs, the BBC, Agence France Press, the NYT blogs, Bioversity International and bits of the blogosphere. In a bit of Kafkaesque logic, the property developers maintain that because it contains a “priceless collection,” no monetary value can be assigned to Pavlovsk Station, so, therefore, it is essentially worthless. Furthermore, the Federal Fund of Residential Real Estate Development has argued that the collection was never officially registered and thus it does not officially exist. The BBC’s story echoes a point made by Sergey Alexanian of the Vavilov Institute, that as the land is for sale, one way to save the collection would be for the Vavilov Institute to simply buy the sites. How about one of those newly-minted philanthrocapitalists making the impossible possible? One final point. Many people out there are referring to Pavlovsk as a seed bank. This is not quite the whole truth. It is a field genebank, in which almost all the varieties are stored as living plants in the ground. This is necessary because most of the varieties do not breed true from seed. So the only way to maintain the varieties is as plants. Seeds would store the entire genetic diversity of the population, it is true, and could be easily moved, but seeds cannot be used to regenerate the specific package of associated genes that makes up a variety. It is those varieties that have been studied and characterized over the decades at Pavlovsk. It is the studies and the varieties to which they are attached that make the collection so important.